Experience Japanese cuisine and culture at the Japanese Food Festival on Sunday, Nov. 4, from 11 a.m. to 3 p.m. in the Banquet Room and Japanese Garden of the Double Tree Hotel (formerly the Kyoto Grand), 120 S. Los Angeles St. in Little Tokyo. The event will be preceded by a traditional knife ceremony (ho-cho shiki) from 10 to 11 a.m. at the Japanese American National Museum’s National Center for the Preservation of Democracy, First and Central. Reservations required. Tickets: $30. At the hotel, the opening program will include a kagami-wari (sake barrel ceremony) at 11:30 a.m. 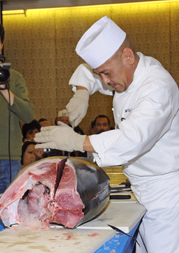 There will be a tuna filleting demonstration at 12 p.m., a sushi-eating contest at 1:30 p.m. and a sushi chef contest at 2:30 p.m. There will also be a jazz, koto and taiko concert. Attendees can sample sushi, ramen, soba, beef bowl, sake, beer, shochu, wine and more. Tickets are $60 (all you can eat). Advance tickets are sold out, but tickets will be available at the door. For more information, visit www.jraamerica.com. Sponsors: Consulate General of Japan in Los Angeles, California Sea Urchin Commission, International Marine Products Inc., JFC International Inc., Mutual Trading Co. Inc., Shirakiku, JTB, Katsu-ya, Asahi, Kirin, Sapporo Beer, Los Angeles Fish Co., Seafood Marketing Inc., Kikkoman, Suzumo, True World Foods, Yamamotoyama of America, Japanese Community Health Inc., JCC, JETRO Los Angeles.